Take out as much as you expect your baby to eat and heat up this amount in a water bath or in a microwave. 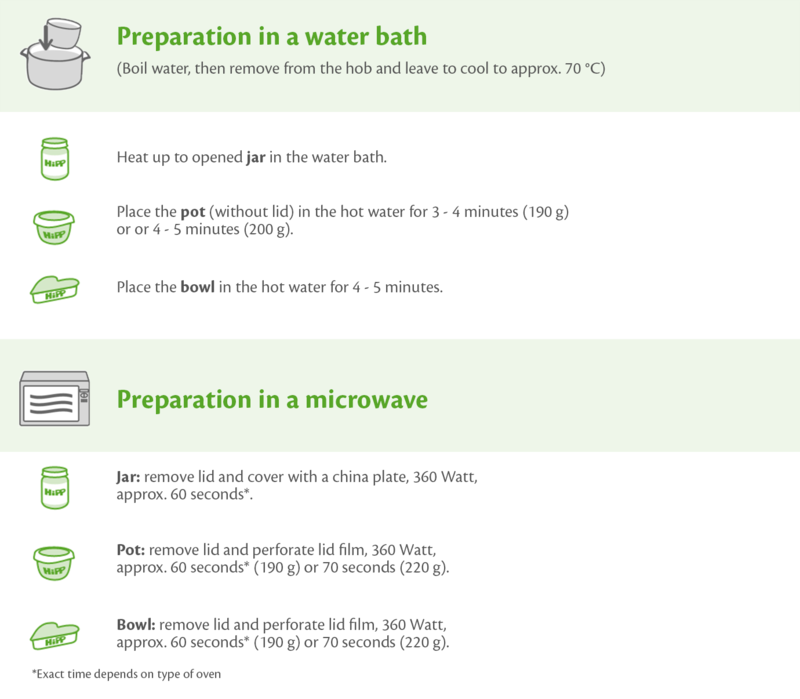 If using a water bath, make sure the temperature does not exceed 70°C because at this temperature the label could come off and cause you to drop the jar. After heating up, stir the content of the jar, pot or bowl well with a plastic spoon and carefully check the temperature. Do not re-use leftovers you have already heated up once. Unheated leftovers can be kept closed in a fridge, but they have to be used up within the next 1 – 2 days (see label). Every jar and pot is checked for perfect sealing prior to leaving our production site. This ensures that only correctly sealed products are delivered. To offer your baby food which is of excellent quality at all times, check whether the packaging is undamaged in the shop and immediately before opening it the first time. As regards jars, try the “lid test”: the centre of the lid should be concave (curved down slightly) and must not give under pressure. Any jar with an upward curved lid should not be used for reasons of safety. In addition, you should notice a clear clicking sound when you open it the first time. As regards pots and bowls, try the “pressure test”: hold the pot with the film face down, slightly press the pot wall – if the product leaks, do not use the content.